A pair of hikers head into the Mokelumne Wilderness at the Carson Pass trailhead on their way across the newly renamed Hungalelti Ridge to Fourth of July Lake. 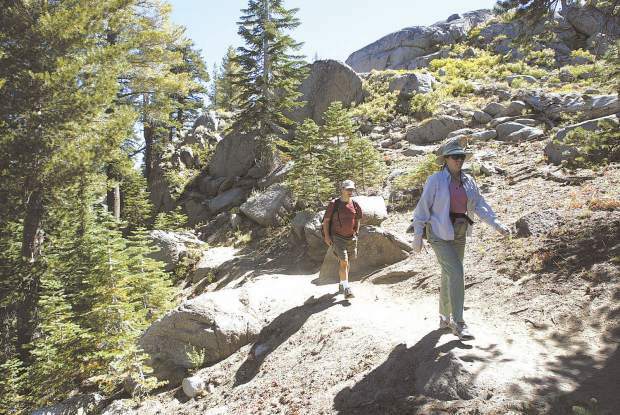 A ridge that stretches south of Caples Lake in the Mokelumne Wilderness has received a Washoe name, officials announced on Monday. Many places with names which included the word “Squaw” have been changed throughout the United States in response to concerns raised by Native Americans and others. The name change process in the Eldorado National Forest began in 2012 when U.S. Forest Service policy on geographic names provided direction that the word “squaw” was derogatory and should be removed from all markers, signs and maps and should no longer be used administratively. The tribe submitted the proposed name change to the U.S. Board of Geographic Names which has purview over place names and geographic features across the country. BGN accepted this proposal for its review and approval process which included consulting with the Forest Service and local governments.